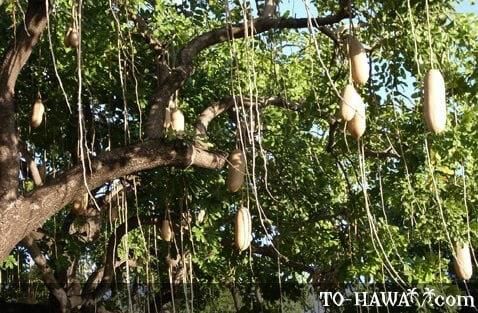 The kigelia tree is more commonly known as sausage tree, referring to the sausage-like fruit it bears. The fruit is heavy and wood-like and difficult to open without a knife. In its raw state it is poisonous. In African folk medicine it is first dried, roasted or fermented before being consumed to cure a variety of ailments, such as rheumatism or snakebites. 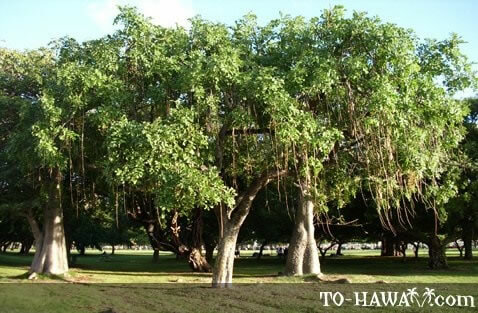 The tree grows up to 65 feet (20 m) tall and its bark is grey and peeling on older trees. Its wood is a pale brown or yellow. 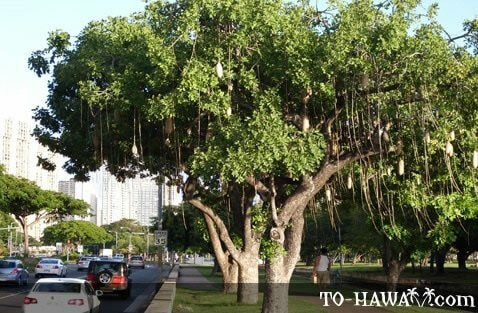 The tree is interesting to look at because of its unusual looking fruit, however, it is not a good idea to have a picnic in a sausage tree's shade as the falling fruit can cause serious injury.